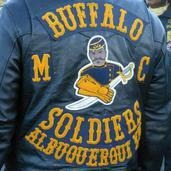 •​ THE NEW MEXICO BUFFALO SOLDIERS MOTORCYCLE CLUB - the 88th chapter- is the first motorcycle club to represent the Buffalo Soldiers in the State of New Mexico. Buffalo Soldiers on "steel horses" are recent to New Mexico, but the original Buffalo Soldiers roamed this part of the southwest on their "real horses" since the end of the Civil War. It is in their honor and in due respect to their legacy and contribution to this great country that we join other chapters of the National Association of Buffalo Soldiers & Troopers Motorcycle Clubs. • IN THE BEGINNING...In 1993, the Buffalo Troopers Motorcycle Club of Chicago brought together bikers who shared a love and respect for riding. The name was chosen to honor the heroic legacy of the original Buffalo Soldiers of the 9th and 10th Cavalry that fought valiantly during the Civil War. Soon after the Chicago club was formed, others took interest and started chapters in the States of Maryland, Florida, Delaware, Virginia and New Jersey. Today, over 100 chapters strong across the United States (including Hawaii), the National Association of Buffalo Soldiers and Troopers Motorcycle Club thrives as the largest predominately African American motorcycle club in the world, One Club, One Patch, One Mindset. • TRUE BIKERS THAT CARE...With a shared understanding of the importance of safe riding, there is the added pride of representing a positive image as role models to youth in the communities where we live and work. Chapter memberships are open to bikers that support the charitable and educational commitments of this law abiding non-profit organization that does not discriminate against anyone based upon their race, religion, age, gender or ethnic origin. • MEMBERSHIP...Club memberships include men and women from all walks of life, including veterans and active duty military, professionals, law enforcement officers, teachers and everyday bikers. One Club, One Patch, One Mindset. We do NOT claim any territory or area.